Discover art and culture in Tuscany! Dievole’s location, situated in the south-eastern part of the historic Chianti wine region, is an ideal base for discovering some of the most authentic gems of Tuscany and for organizing various art activities. Siena can be found just 12 km from our village, a UNESCO World Heritage Site since 1995 and a city universally known for having kept its medieval characteristics mostly intact, from the fortified defense walls and its monumental gates to the city’s urban fabric, with its winding alleys that converge on the incredibly beautiful piazza del Campo, a one-of-a-kind thanks to its shell shape, not to mention the stunning religious complex comprising the Cathedral, Crypt, Baptistery, the so-called Facciatone, a unique piece of architecture that was part of a large-scale building project for the cathedral, intended to cover the entire upper part of the city, and Santa Maria della Scala, a former hospital-turned museum. 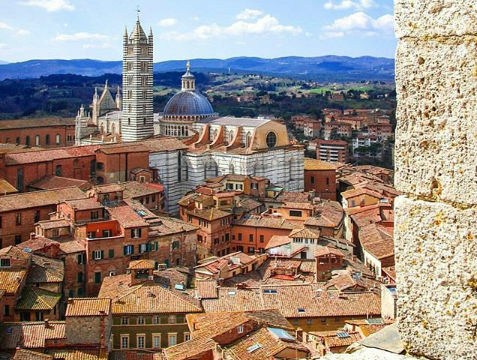 You can also explore Siena’s evocative fountains, connected by a complex system of underground alleys that once guaranteed a water supply to the city’s inhabitants… This exceptional historic and artistic patrimony is perfectly matched by the enchanting countryside, beloved around the world. In July and August, this unique atmosphere is infused with the thrill of the best days of the year: the celebrations tied to the famous Palio di Siena. Only 60 kilometres from our Wine Resort is the “cradle of the Italian Renaissance,” the celebrated city of Florence. Considered one of the most beautiful cities in the world, boasting a wealth of cultural activities, the Tuscan capital (also, of course, a UNESCO World Heritage Site) is universally recognized for the magnificence of its churches – including Santa Maria Novella, Santa Croce and the Cathedral of Santa Maria del Fiore, with Giotto’s famous bell tower alongside it and Brunelleschi’s imposing dome sitting atop, an architectural challenge as admirable today as it was when it was built, not to mention for the elegance of its Renaissance palaces, including Palazzo Vecchio, the wonder of its piazzas and the precious treasures held within its museums, the Uffizi first and foremost but also the Cathedral Museum, Palazzo Pitti, the Bargello, the Medici Chapels and so many more. Another city with undeniable charm not too far from Dievole is Arezzo: a dodecapoli during the Etruscan era, that is, one of the 12 main city-states of the region, the city retained its importance over the centuries thanks to its strategic position along the via Cassia. The amphitheatre dates to the Roman period and is open to the public while the many prestigious monuments, like churches, palaces and artworks, date to the Middle Ages and Renaissance, including the Basilica of San Francesco and its beautiful fresco cycle depicting the Legend of the True Cross by Piero della Francesca, the Medici Fortress, the Church of San Francesco and its wooden Crucifix by Cimabue, and the picturesque Piazza Grande, where the antiques fair is held every first weekend of the month, as well as the celebrated Saracen Joust, boasting medieval origins. Among the smaller towns within 50 km of Dievole, we can’t fail to mention the nearby Monteriggioni, with its medieval walls and towers that stood out even to Dante (Inferno, canto XXXI), San Gimignano, famous for its tall tower-houses, a proud architectural statement by the most powerful families in the Middle Ages, and the towns belonging to the Lega del Chianti, including the “capital” Radda in Chianti, surrounded by a mostly intact defense wall and whose centre is the piazza where the evocative Palazzo del Podestà can be found, as well as Greve in Chianti, home to a fascinating triangular piazza bordered on all three sides by porticoes. Other suggestions for what to do are available at this link.